The UK Government has decided that from October 1st, 'cosmetic' treatments, using lasers and IPL, no longer need to be regulated and therefore do not need to be with the Care Quality Commission (CQC) and therefore need to pay VAT. The British Association of Aesthetic Plastic Surgeons (a not-for-profit organization) denounced the Department of Health's (DOH) proposals to deregulate lasers and Intense Pulsed Light (IPL) technologies when used for 'aesthetic' (non-medical) purposes. Most experienced professionals disapprove of the complete removal of regulation for those who are not "Healthcare Professionals", and do not treat "Disease, Disorder or Injury". In layman's terms, healthcare professionals who have been trained and are members of associations and use IPL for Rosacea and other medical conditions are both experienced and regulated, however 'non healthcare professionals' are deemed not to deliver medical treatments and so can use the same equipment for tattoo removal and skin rejuvenation (i.e. non medical applications) without regulation. For the more cynical person, it can be said that this deregulation allows VAT to be charged on the rapidly growing areas of IPL and laser light for tattoo removal, hair removal and alternatives to invasive cosmetic surgery. Non-healthcare professionals are deemed not to deliver medical treatments and so can use the same equipment for tattoo removal and skin rejuvenation if it is deemed as being purely for cosmetic reasons and not for a medical condition. 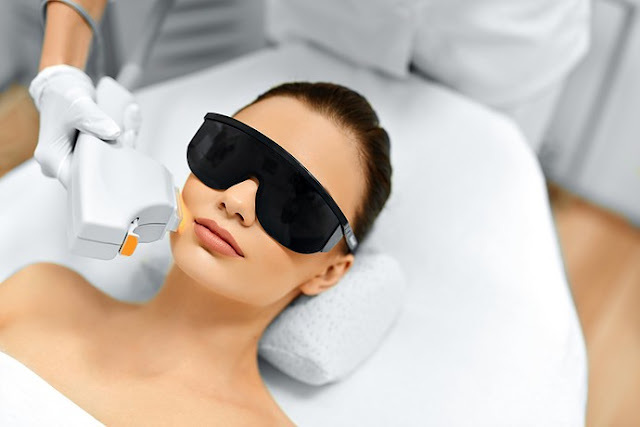 It might be argued that any form of skin rejuvenation is the treatment of skin injury due aging or the sun, or UV damage and therefore non-healthcare professionals should not provide this treatment, but it is unclear who actually has the responsibility for regulating these types of laser and light treatments. IPL can treat rosacea and remove unsightly thread veins and birthmarks. This powerful technology can also remove unwanted body hair and reduce scarring and stretch marks and so have become a very common non-surgical medical procedure. IPL treatment (in the right hands) has been enormously successful, however, following deregulation, we can now expect to hear horror stories relating to operatives with insufficient training and lack of experience who have invested in this equipment in the hope of 'making money'. When beauty salons might get 'sun tanning equipment' before regulation, thousands of individuals suffered damage.It is now expected that beauty salons looking 'for a profit' will try their hand at IPL and laser treatments. In September 2010 the British Association of Aesthetic Plastic Surgeons (BAAPS) raised concerns over more patients requiring corrective treatment following 'botched laser therapy'. Prior to the deregulation 'practitioners' had to register with the governing body the Care Quality Commission (CQC) and follow strict guidelines, but now 'anyone can buy a laser for cosmetic use'. A lady aged 38 went for hair removal. On her third visit she mentioned she had stretch marks, and the therapist said the same equipment could treat those as well. The lady had treatment for the stretch marks and then had to go to A & E because of blistering; the doctors said she had 'third-degree burns' as the therapist had used the wrong settings. The settings for hair removal are not the same as for removal of stretch marks! It is estimated that there are 1,000 unlicensed practitioners operating in the UK and last year (2009) there were nearly 4000 reports of adverse laser/ light treatment effects, therefore deregulation will cause an increase in the number of people suffering damage. In addition to burns, the use of IPL by an inexperienced person can cause permanent pigmentation changes. If the safety goggles are not worn correctly there can be retinal damage and blindness. IPL uses different light frequencies to target different skin tissues and or skin conditions. A shorter wavelength will affect the red coloration of thread veins, a higher wavelength (more likely to cause burning) is used for hair removal. The two are completely separate and must not be mixed up or can cause untold damage. Understanding this and administering it correctly is a highly specialized procedure, always use experienced healthcare professional. A wide range of drugs can affect the response of the skin to light treatments and include St John's Wort, which makes skin more sensitive and so more likely to be damaged; antiplatelet drugs and blood-thinning drugs such as aspirin may cause excessive bruising and some diabetic drugs also increase sensitivity. Regardless of whether the treatment you are receiving is classed as medical or non-medical. Use a well-established clinic for any IPL or Laser treatment, deregulation does not mean that regulation is not needed. * What coaching have workers had? * however usually instrumentation is serviced? - - should be at least six monthly. * Do they have or know the statistics relating to adverse effects? * What action can they take and can they supply support if one thing goes wrong? * What kind of insurance do they have?